Made from pure chamomile flowers and natural citrus flavors, this Steep by Bigelow organic chamomile citrus herbal tea is a delicate and soothing blend to help calm your senses. The bright blend of citrus flavors makes it a refreshing tea to serve either hot or iced. Though this herbal tea does not contain caffeine, it is made from a flavorful mix of organic lemongrass, chamomile, and lemon peel. Steep by Bigelow organic teas, such as this chamomile citrus herbal tea, are grown using only natural fertilizers that are free of synthetic pesticides and additives. This is a great tasting tea. Like the fact that it is an organic product for a very reasonable price point. Love the dispenser box. We just leave it on the counter for people to see. Our caffeine free customers love this tea for its relaxing quality. Great shelf life and love the individual packages! Will keep your customers coming back for more! Chamomile and citrus is a perfect blend for a herbal tea and it is awesome when it is organic, you can feel the tones as soon as the bags meet the bags. Delicious chamomile tea. Most chamomiles are boring and flavorless, not this citrus one! Easy to make a delicious to drink. Add to hot water and have delicious cup of tea in under 5 minutes. This is my go-to tea for relaxing at night with a good book before bed. I think it tastes amazing as is, but sometimes I’ll put a thin lemon slice with honey if I’m feeling a little under the weather. This was a great price for organic tea! Has a lovely mellow, herbal flavor that we all enjoyed. So naturally sweet it doesn't even require honey. The chamomile citrus tea by Steep is a “cozy” tea. It’s caffeine free so it can be enjoyed at any time of the day. The citrus flavor is very mild but nice. The Steep by Bigelow organic chamomile citrus tea is a very relaxing tea that is great for our spa. Our clients love the soothing properties of the tea. The packaging is great and inviting. This is a delicious chamomile, with a little more flavor than typical because of the citrus. The box displays beautifully, and we serve it to our customers, plus sell it by the box on our shelves. I highly recommend any of the steep teas. This is a nice tea, both hot and iced. The citrus notes compliment the chamomile , making both tastier and more complex. The packaging is attractive and each bag is individually wrapped for freshness. The tea is also very reasonably priced for an organic product. 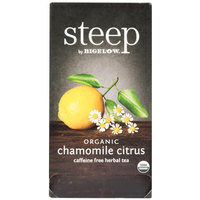 Steep by Bigelow Organic Chamomile Citrus Tea has the perfect blend of Chamomile and citrus. It has many medicinal effects, tastes great and steeps well. The Steep organic chamomile citrus tea is so soothing and makes me relax and unwind. It is a great that I drink every evening. The flavors are awesome together. This is such a refreshing, delicious blend with the zip of citrus and the calm depth of chamomile! It is calming and peaceful yet leaves you feeling energized. A great tea! And so healthy too! Anther wonderful organic option from Steep. The chamomile citrus tea is soothing and relaxing. It is the perfect blend of tea to drink before going to bed. We ordered a variety pack and these went faster than others, so customers really enjoyed the tea. I would recommend if you are not wanting to order variety pack. A delicious and soothing citrus tasting tea with this product. I have also found this tea to be very tasty iced with a little sugar as well! This chamomile citrus tea is pretty tasty for an herbal tea. It's not overwhelmingly citrusy. The steep line from Bigelow is definitely a small step up from their other line of teas. I always loved chamomile tea. But this one from Bigelow adds nice citrus undertone as well! It is such a nice combination! And its organic! I love all tea, but my favorite by far is Steep's Bigelow Organic Chamomile Citrus Tea. It has the nice earthy taste of chamomile with an undertone of citrus that make for a fantastic concoction. I would highly recommend this product to anyone. Never been crazy about chamomile tea, but I thought this one was decent. Love that's it's USDA organic. If you like chamomile tea, this one is worth trying. Organic and made by Bigelow. Bit pricey but worth every penny. Such an enjoyment to sit down with one of these. Well worth the name and quality in the Bigelow name! Steep by Bigelow Organic Chamomile Citrus Tea was one of five varieties I purchased from Webstaurant for myself and as gifts for the holidays. This tea has a delicate flavor with a nice lemon aroma. I used all my teas for hot tea, but they could also be used for iced tea if that is your preference. Ordering was easy, delivery very prompt and the tea itself was very economical. I appreciate that I can order from Webstaurant as an individual with no minimum order. This was my third order and I continue to enjoy getting their email updates on new products and sales. Plus the option of earning credit for honest reviews is a terrific perk! I can't describe how much I love Chamomile tea! This Steep version is no disappointment. I enjoy a glass each night before bed, and would encourage others to do the same for a nice restful sleep! Sir Clean recommend this product, the flavor is really good, the quality and price are the best. We like it! Perfect for restaurant, bakery etc. The hint of citrus dances on the tongue with the combination of the divine flavor of the chamomile tea. Most recommended to everyone that is reading. Bigelow's Steep line is a great tasting and high quality tea and this chamomile citrus flavor is no exception. It's a full bodied caffeine free tea that has a lot of flavor. We really loved this tea. It has a great balance of flavors, not too strong on the chamomile. Glad to see that there are organic options! I was expecting a stronger presence of citrus considering it has three ingredients of oils and peel. It tasted fine but more or less just a chamomile tea with a hint of citrus. It's still really enjoyable but just seems like an odd combo. This is a yummy citrus chamomile tea! I love it right before bed to help calm me down. The citrus is light and refreshing. Great product. This Chamomile Citrus Tea is a great flavor. We have always had plain Chamomile so this was a delightful change. There is just the right hint of citrus so the chamomile flavor and aroma can be enjoyed at the same time. Our customers have commented that they don't regularly drink Chamomile tea, but since this has the citrus flavor it has more depth and they are enjoying it. Will continue to buy this product for our tea service. Our guests love Bigelow's new Steep Tea! It is flavorful, organic, and the blend of Chamomile and Lemon is a light but delicious combination that is delightful and refreshing. It is a big hit with us! This is a really nice tea. This has a really nice scent with nice packaging. I like that this is organic. Decent flavor. Overall a decent product.